Inventory valuation methods are used to calculate the cost of goods sold and cost of ending inventory. Following inventory valuation methods are supported by RepairDesk. This method of inventory valuation is exactly opposite to first-in-first-out method. Here it is assumed that newer inventory is sold first and older remains in inventory. When prices of goods increase, cost of goods sold in LIFO method is relatively higher and ending inventory balance is relatively lower. This is because the cost goods sold mostly consists of newer higher priced goods and ending inventory cost consists of older low priced items. Note: for serialized inventory – the cost of each serial will be used to calculate the COGS. How can I add a new item to inventory and its inventory valuation method? 3. Enter information in each tab of Product Info, Stick, and Prices. 4. From the Prices tab select the inventory valuation method for inventory item. This valuation method will affect the calculation of COGS. 5. Finally, click on Save Item button to add an item to inventory. Note: There are several ways through which item is added, you need to select valuation method or the system will automatically select weighted average as valuation method. Inquiry for Item Transactions from Item Master where all purchase, sales, and adjustments can be tracked. Q.How over existing item will be treated once inventory valuation method is deployed? A. Once inventory valuation is deployed, all the existing item will be marked as a weighted average. if the item is added from GRN, inventory adjustment and inventory upload, the cost will be updated as a weighted average. Q. How can I change the Valuation method of Item? A. Once On hand quantity is zero, only then you can change the valuation method for item.if there is some on hand quantity then the system will not allow changing the valuation method. Q. Is it mandatory to select the valuation method at the time of item creation? A. Yes, it is mandatory to select the valuation method, but if you don't select any valuation method system will auto select weighted average. Q.How valuation method will work in case of Serialized Item? A. 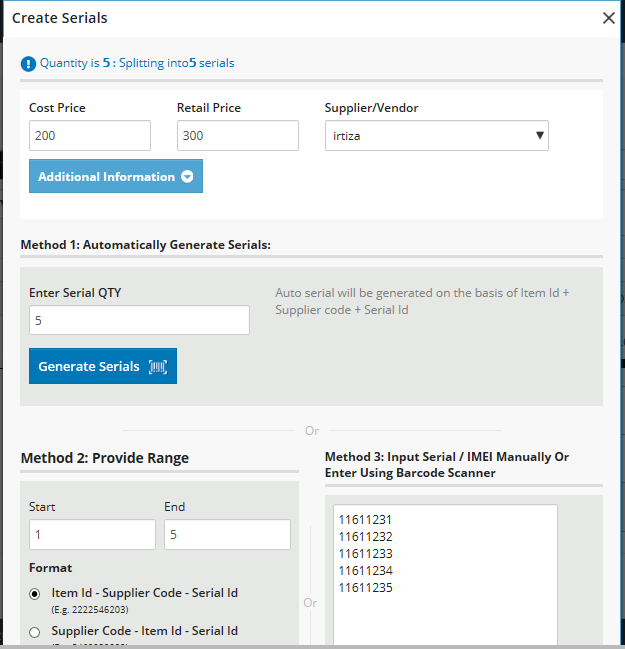 In case of serialized inventory, when user will select an option of manage serials selection of valuation method will be disabled. Valuation method field is hidden when Manage serialized inventory is Yes. Inventory Valuation method will have no effect on serialized inventory, as each serial will sold as per its individual price assigned to it. Note: serialized inventory will be sold as per Cost associated with each serial. Valuation method cannot be added against a serialized item. Q.In case of inventory transfer which cost will be used in a transaction? A. In inventory transfer, only quantity is received from other store and weighted average cost of the current store is associated with the transferred item. Q. Can I sell out of stock item through POS screen? A.No, you are not allowed to sell out of stock item. You have to make a positive adjustment and add inventory otherwise system will not allow the transaction. Q. Does iPad support Inventory Valuation method? A. Yes, iPad doesn't support the inventory valuation method. Q. Can i create serials for an item who's valuation method is set as lifo,fifo or WACC? A. when GRN is received against any item against which valuation method is set , and user create serials while creating GRN , that item will be changed to serialized item and valuation method will be changed. Note: if user adopted FIFO or LIFO valuation method, only items with zero quantity will be updated as LIFO or FIFO valuation method. Those items which have on hand quantity will be added as weighted average. For serialized item valuation method will be disabled. Below are some of the cases related to Inventory valuation, that how transactions are carried out. When item’s valuation is set as Weighted Average. Second item is added through GRN with cost=30. 3. When new adjustment is made against a current item with different cost weighted average is changed. Admin history will be updated accordingly. 5. COGS will be shown in the following report as per weighted average valuation method. When the item’s valuation is set as Last in First Out. 2. Received different GRN of the same item at different cost prices. 3. At the time of sales transaction system will sell out the item as per valuation method. As item with cost 60 was added last. so while sales transaction it was sold first. It can be verified by admin history and the last GRN Created. 5. when sales transaction is carried out system will sell item with cost 80 as it was added at last in the system. It can be verified by Admin history and last GRN Created. When item’s valuation is set as First In First Out. 3. Received three GRN of same item at different cost. 4. At the time of sales transaction system will sell out the item as per valuation method. As item with cost 30 was added first so while sales transaction it was sold first. 6. when sales transaction is carried out system will sell item with cost= 50 as it was added first in the system as compared to other item quantity. You can see due to FIFO Method Item that is added First is sell out first. 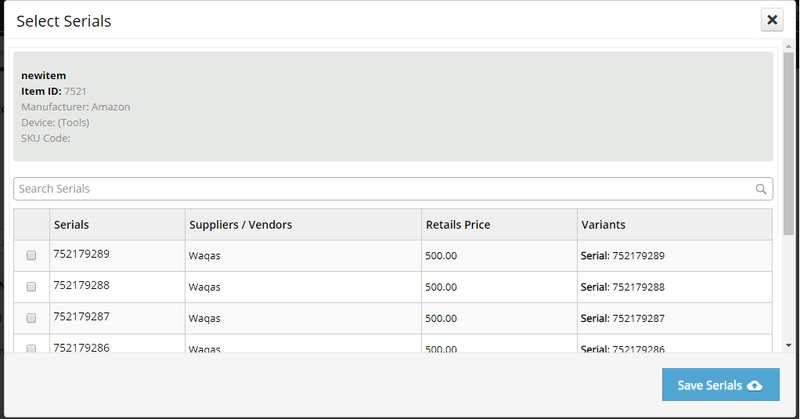 In case of serialized inventory when we click on manage serials Selection of valuation method disappears. In case of serialized inventory every serial may have different cost price and different retail price. Profit is calculated as per serial cost .each serial has its own cost and profit is calculated accordingly. User can either generate serial at the time of receiving GRN. Price is zero, a user want to have different cost price for each serial. 3. Clicking on create serial will open a popup. Press save and serials will be created. 4. When serials are created against any newly added item, selection of valuation method is disabled for that item. 5. User can give different cost and retail price to each serial. 6. At the time of making transaction system allow us to select which serial we want to sell. When we select a specific serial cost associated with it will be used for profit calculation.